I wanted to do something fun this year for the family in anticipation of Christmas. Trying to instill that the heart of Christmas is more about giving than receiving when you live with a 9, 4, and 2 year old is challenging. To be practical, the little people that live in my house are not naturally altruistic....shocker I know. But I also don't want to take all the fun out of Christmas and make them donate all their toys to needy kids across the world while singing Silent Night and eating rice and beans for Christmas Dinner. I mean, I want them to enjoy watching Elf and sipping hot cocoa but I also want to them to learn how to give and do for others. 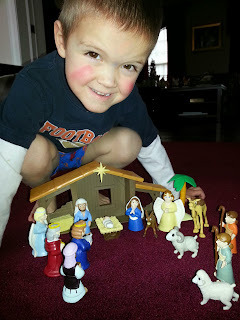 I created this 24 day countdown to Christmas calendar as a fun way to celebrate our family, others, and the birth of Christ but in a more intentional way. Here is what I came up with. Using some white and green cardstock paper, a tag maker to punch out the shapes, some ribbon, and a few holiday craft clothes pins that I picked up at the dollar store, I came up with this idea of 24 activities for our family to do. I cut out the tags, printed out the numbers on cardstock and glued them to the front. Then I typed up 24 activities which I taped to the back. Using a square picture frame that I already had at my house (but you could also pick one up from Goodwill) I cut the ribbon to pull across the front of the frame and taped it to the back so I could hang my tags for each day. The kids were super excited when I put it together and hung it up on the last day of November. On December 1 their activity was to open a Christmas gift. I usually a buy them a Christmas book or movie, a pair of Christmas PJ's, or a small lego set. This has been a really fun way to enjoy the season, celebrate the birth of Christ, and get my kids excited to focus on others. You can print out all types of numbered tags online. 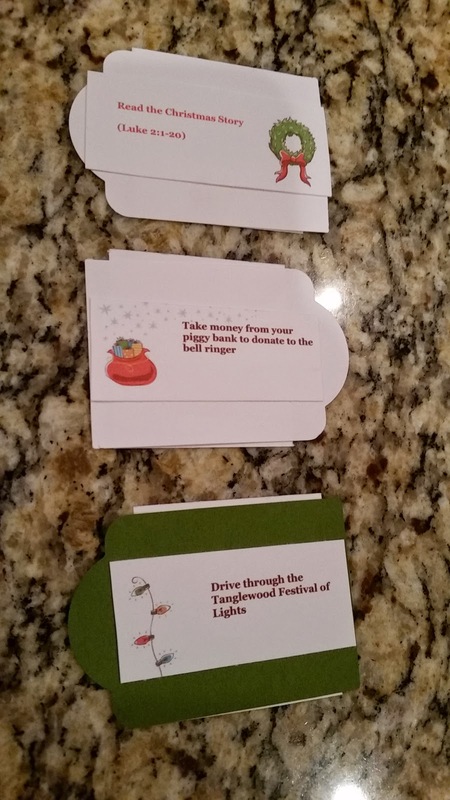 Just Google Holiday Advent Tags or Printable Holiday Numbers. The activities that we used for our calendar are below, but feel free to tailor it to fit your own family traditions, needs, and activities. If you don't have time to do all 24 days leading up to Christmas, then you could do just 12 days of Christmas (before or after Dec 25) or you could do just the 7 days leading up to Christmas Day. 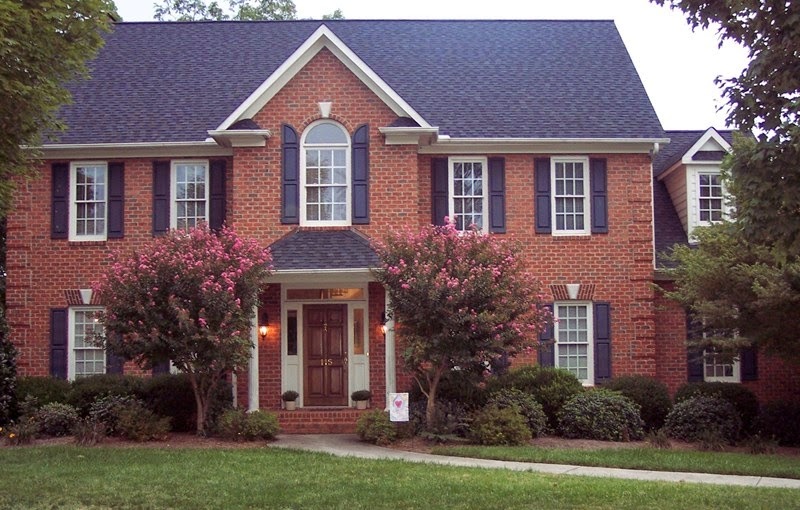 Again, make it fun for your family and keep it as simple as you please! Enjoy the holiday season! 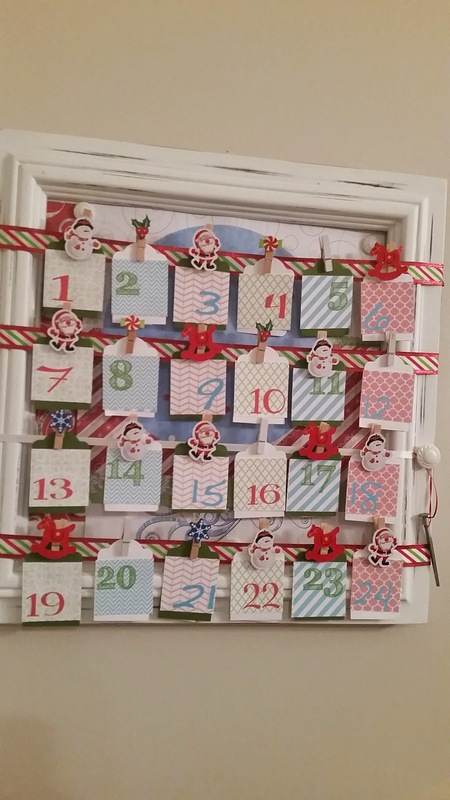 I would absolutely love to hear your advent activities and how your family likes to countdown for Christmas. Sing Happy Birthday to Jesus!! !